It was a bridge too far for Wild when they travelled to the Midlands to meet table topping Solihull Barons. Late player unavailability gave Widnes a mountain to climb. Only four defencemen travelled and Wild were without the speed of Ben Brown and Filip Supa. A good Wild following welcomed the team onto the ice in front of easily the biggest away crowd of the season to date. The game opened at a furious pace with both teams breaking quickly on their opponents net. Chris Preston and Tom Ratcliffe both tested Hewitt on the breakaway inside the first five minutes. At the other end, the outstanding Steve Gilmartin was repeatedly brought into action as the slick passing Barons bombarded his goal. Shaun Dipnall skated clear for Wild in the 7th minute but his angled shot flashed wide of the right hand post. Barons were playing with a man high in the Widnes end and only scrambling defence prevented an opening goal. Three excellent saves from Gilmartin between the 8th and 10th minutes were much appreciated by the big crowd and further key saves with the puck fired through a crowd of players, kept the game scoreless. The crowd were brought to their feet just before the interval as Wild's Mark Higson and Rob Eley for the Barons traded blows in front of the Wild net. Eley took 6 minutes in the penalty box and Higson went to the dressing room for treatment to a wound under the eye. The second period opened with Solihull adopting slightly different attacking options. They repeatedly drove in towards the net, forcing Steve Gilmartin to save bravely at the feet of the home forwards. Finally the deadlock was broken in the 23rd minute with Joe Henry unmarked forcing the puck home from the edge of the crease. Within three minutes a set face-off play from Widnes saw Callum Ruddick equalise after taking a Lee Pollitt pass. After action at both ends of the ice, Solihull restored the lead when a Widnes break out in the 32nd minute was interrupted and Henry and Slater combined to give the Barons the lead back. Tired legs were evident within the Wild ranks and three goals within three minutes saw Solihull pull well ahead. 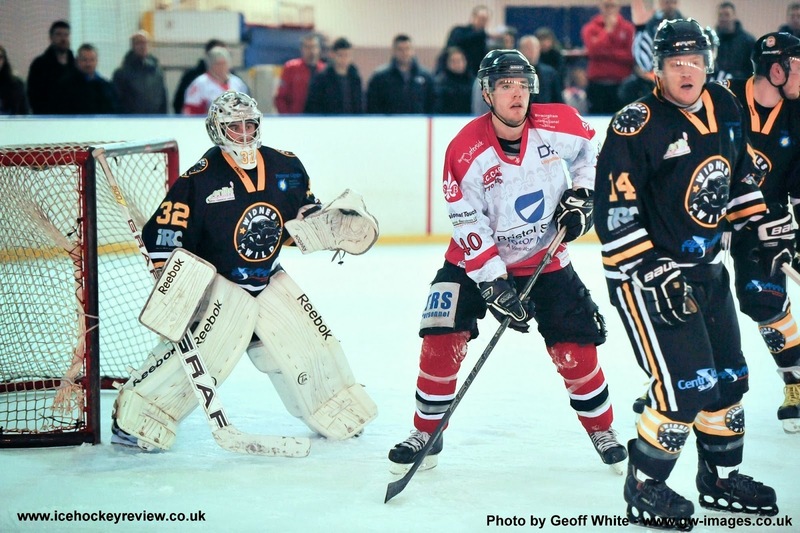 The third period opened with a sixth Solihull goal within twenty seconds of the restart. A Widnes attack broke down and a quick breakout saw Joe Henry putting the Barons further ahead. Widnes battled hard to get back into the game but the only further goal came from the Barons in the 56th minute when Richard Slater found the bottom right corner of the net after good work by Henry and Selwood. As the game drew to a close, Steve Gilmartin made the save of the game, diving to the right to keep out a fierce angled shot. He deservedly took the MVP for Wild after taking an incredible 79 shots. For long periods of the game, Wild competed well with their high flying opponents, the real standout team in the Laidler Conference. 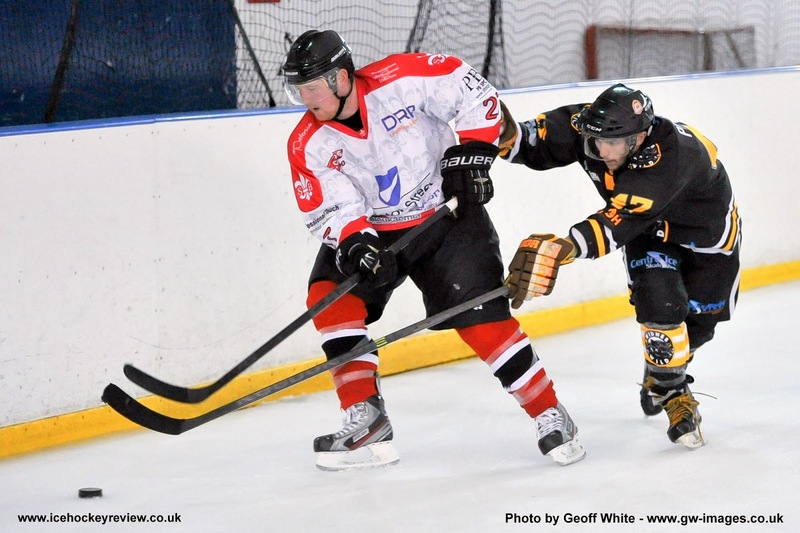 Next weekend sees Wild travel to Sheffield on Saturday ( f.o. 15.45) before returning home to meet Coventry Blaze on Sunday ( f.o. 18.00). Hopefully, with greater player availability, Wild will be confident of adding to their league points total. Top Photo: Defenceman Josh Grocutt with Netminder Steve Gilmartin who was MVP after saving 72 of the 79 shots he faced. Bottom Photo: Wild's Chris Preston challenges for possession.